It might be argued that the rise of pentecostalism, in part, was a needed corrective to the scepticism so prevalant within modern, Enlightenment-influenced ways of thinking and perceiving reality. The same could also be said of the "charismatic movement" and of the so-called "third wave" -- efforts to restore signs and wonders to the message of "good news" as taught by Jesus. The importance of signs and wonders figures prominently in the Book of Acts, and seems to be indicative of the ministry of the early church. Signs and wonders stand not only at the center of this chiastic structure, but also appear here as the third time the phenomenon is mentioned in chapter 2 (v.19, v.22, v.43). This clearly lifts the phrase to a place of special emphasis within the text. And the context suggests that signs and wonders were instrumental in the spreading of the gospel and the growth of the church. Are we afraid to let go and trust the Holy Spirit with anything supernatural? Were signs and wonders simply the "language" ancient peoples could best understand, but which is no longer true of people living in the 21st century? Or... do signs and wonders constitute a vital component in God's restorative plan for humankind, somewhat similar to how we must each rely on the Holy Spirit's help in our pursuit of sanctification/theosis? Signs & Wonders are always such a mixed bag. When Jesus was asked for a 'sign' he said it was a "wicked and adulterous generation asks for a miraculous sign!" and I've always been put off by "well if you are not healed, the problem is your FAITH!!!" I think that there is a major difference in saying that God is still God and is not limited by time/space and can Heal whomever He wants (which I believe) and saying that signs & wonders happen all the time. I don't know. I tend to 'distrust' the gifts of the Spirit and would like to see more emphasis on the Fruit. "Signs & Wonders are always such a mixed bag." Yes! That's why this is a topic perfect for Paradoxology! Yes! That's why this is a topic perfect for Paradoxology! Indeed. But how can something Jesus said that the 'wicked & adulterous' seek after be something that is 'integral' to the mission of the church? Signs & Wonders following, says Mark 16. Following what? I agree that the focus needs to be on the fruit of the Spirit, but I do not distrust the gifts of the Spirit. God doesn't give bad gifts, but unfortunately those gifts operate through flawed individuals. If discipleship were what it should be and people functioned in the gifts with evidence of the fruit of the Spirit, especially with love, there wouldn't be many problems. The problem with the idea that God is soveriegn and he heals who he wants is that healing and the other "gifts" of the Spirit are only exercised through faith. Also, Jesus told his disciples "you have not because you ask not." I have had the priviledge of praying for people and God healed them. I've also been heartbroken when I've prayed for healing for people, and they weren't healed (at least not in this world.) I don't understand why some are healed and others are not and I certainly don't believe its always a "lack of faith" for the person being healed. My response is I believe and pray in faith believing, but in the end my faith is in God who loves that person a lot more than I do and will do what is best for them. I believe we will see more of the supernatural God. I'm not so much in it for a "signs" sake, but for compassion who need the supernatural touch of God. I want to see healing and deliverance for people that are suffering. So while these things are signs and can have a powerful impact on non-believers. I believe these supernatural acts have even more power not as a sign for the sake of a sign, but as a sign of God's love for people. My prayer used to be Lord let me take signs and wonders to the street. In the past year, my prayer has changed to Lord, let me love you with all my heart, soul, mind and strength and let me love my neigbor as myself. I suspect, if we ever get to that point, we'll see miracles that haven't been seen since the Book of Acts. I do believe that this is part of God's restorative plan. I believe the cross was more than just getting to Heaven. It was real redemption. I believe God always intended men to live supernaturally, because while we are physical beings, we are also spiritual beings. I think Jesus, the Last Adam was a representation of the way we are supposed to live and that included signs and wonders, but never for the sake of "showing off" but for the purpose of helping and building up people. I don't distrust the fruit of the spirit either. But an Emphasis on them. I know God still intervenes 'supernaturally' in the lives of His children. I'm someone that believes in miracles. I just have seen too much 'wild fire' to even want to try 'fire' again. I understand. I left the charismatic church for a while myself, because of things like "gold dust." But I believe in it, and for me the key is getting first things first. Peace to you. - interesting you said Oneness pentecostal...Rhema, it sounds like some of your journey has been similar to mine. I'm having to still work through some of the stuff. But I want to hold on to the parts that are good even though there was lots of junk too. Peace to you, brother. Deuteronomy 13 speaks about signs and wonders as a heart test and that is in all probability what the hearers of Jesus’ statement thought about as he spoke. Moses through the Holy Spirit warned about the foundation of the teaching coming forth from the purveyor of the supernatural. Looking into Acts 2 the evangelism and community life is fashioned around “the Apostles’ teaching” verse 42, which as alluded to by Seraphim has become conspicuously void of Scripture’s standards. Many avoid or overlook the “fruit” issues since fruit results from cultivation and in our glory based society takes to long and one often times has to get dirty, and as you touched on in the cry for virtue many leaders / teachers themselves need to check their vine 2nd Corth. 13:5. Moreover as I posed this question to the denomination I am a part of, a charismatic group, are the gifts relegated only to tongues and healing are these the only signs and wonders. What about administration (having that in my gift mix would be a wonder indeed) is that not what Jesus molded by instructing the disciples to group the multitude being feed the loaves and fish. Is that not quite a sign and wonder one that we seem to overlook in that account. Jesus seems to exercise the gift of discernment constantly as He moves about the streets of His day. Who to heal who to teach who to have mercy upon even in the event of “catching” the adulterous woman. The teachers of the Law were calling Him on the carpet Jesus uses the gift of knowledge and wisdom knowing that the man needed to be there as well, and I could ramble on but which of these “lesser” gifts are not signs and wonders? Drama or reconciliation? I think that while 'gifts of the spirit' are in Scripture, and certainly there's no reason they "can't happen", they're not well attested in early Christian history. Usually the "spirit" gives much more practical gifts. One thing to consider is that usually "prophecy" was a gift that was considered to be the gift of "prophetically expounding Scriptures". Sort of de-mystifies that one, although it also validates it's use in a more believable way. I tend to think that demanding physical manifestations of 'signs and wonders' is more of a Pentacostal desire than something we can necessarily say is traditionally accounted for. I suppose I'm with Seraphim on this one - magical gifts or not, who cares? We always have to 'test the spirits' to see if they're of God... or something else, and the litmus test isn't their 'power', but their correspondence to the proclamation of the crucified and resurrected Messiah. "I'm not so much in it for a "signs" sake, but for compassion who need the supernatural touch of God. I want to see healing and deliverance for people that are suffering." 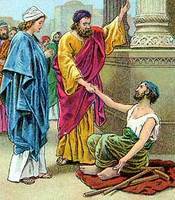 Jesus often healed or helped people because he was "moved with compassion." We should strive for this same motivation more often. Teaching is obviously important, but sometimes people just need God to break in on them and help, don't you think? "I just have seen too much 'wild fire' to even want to try 'fire' again." Ahh, come on now. I don't hear you saying "I just have seen too much 'bad teaching' to even want to hear 'teaching' again." Of course not. I think the emerging culture is all about signs and wonders. I hear them "reading omens" all the time. Little things they see happening to them that must be supernatural direction, or so they say. Yet often times they are self-fulfilling interpretations of everyday events. But I don't know that miraculous manifestations are the best current cultural key to authenticate the gospel. That has been the case in the past, even the recent past, and I am sure it will be again some time soon. But for now I think there are other more contemplative, ongoing supernatural expressions that will emerge as the authenticators for todays culture. I would expect and do see more dreams and visions, more "quiet tongues", more quiet healings, more gifts of faith, etc. All this is very supernatural, but necessarily very superstar. We really do need the fulness of the Holy Spirit but I think it will happen in new places rather than the "alter" at the end of public services.